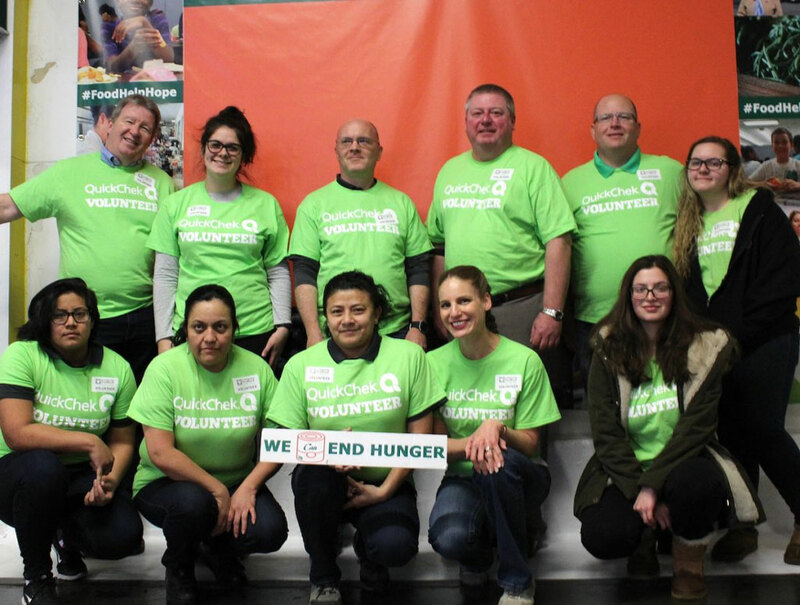 WHITEHOUSE STATION, NJ — Committed to taking its ability to feed people to the store level and beyond, QuickChek team members continue to aid thousands of families in need. The Whitehouse Station, NJ-based fresh convenience market chain recent fundraising for the annual holiday Check-Out Hunger campaign increased the company’s total amount raised to $561,000 in the four years it has been a campaign partner. Check-Out Hunger takes place at most major supermarkets and convenience stores throughout the region, benefiting more than 30 Feeding America food banks and affiliates from New England to Florida. Shoppers at each of QuickChek’s 154 stores throughout New Jersey, New York’s Hudson Valley and Long Island helped feed hungry families in their communities by donating $1, $3 or $5 coupons at store check-out counters during a six-week period that ran through December 16, 2017, providing food, help and hope to those in need. Each $1 donated to the Feeding America organization provides 11 meals through the Feeding America network, which works with manufacturers and retailers across the country to secure safe, healthy food that would otherwise go to waste. Those donations are provided to food banks across the country, which then distribute them to people in need. QuickChek raised $127,500 during the 2017 campaign. All of the money raised benefits those in need during the important Thanksgiving and December holiday season within the counties in which QuickChek operates store locations. QuickChek’s commitment is year-round. Twenty-four volunteers from the company’s headquarters and various stores were at the Community Food Bank of New Jersey in Hillside in late December, where they sorted and packed frozen meat and entrees. When their shift ended, the QuickChek team had packed 868 pounds of frozen food to be ready for distribution to area residents. Team members also volunteer throughout the year to box and sort food donations at the Community FoodBank of New Jersey, Fulfill (formerly the Food Bank of Monmouth and Ocean Counties), the Hudson Valley Food Bank and Long Island Cares. These efforts benefit school children in backpacks, kids’ café and summer meals programs as many school-aged children do not have access to food programs outside of the school year. “Our partnership with the community food banks has been a natural fit and allows us to further embrace and support our local communities where we have store locations by helping our neighbors in their time of need,” said QuickChek CEO Dean Durling, whose family-owned company has been named one of the most generous in the state by New Jersey Monthly magazine. A leader in the fresh convenience industry with an award-winning fresh food and coffee program, QuickChek was named the 2016 National Convenience Store Chain of the Year in part due to its continued dedication to caring for and giving back to and supporting its communities. For additional information please visit www.quickchek.com. Get your favorite made to order subs, smoothies and espresso drinks in a flash with the QuickChek mobile app. Just download, select your store and place your order. It’ll be ready when you are! QuickChek is reinventing Fresh Convenience. Our team members are local to the communities we serve and are passionate about providing the very best in fresh. Each of our stores offers made-to-order subs and sandwiches, guaranteed fresh coffee, healthy snacks and salads, hot breakfast and more! Sign up and receive exclusive QuickChek offers and coupons straight to your inbox. Never miss a deal again! Deals, Mobile Ordering and more!